One of the many advantages of a mobile home is that, by definition, it's a movable object and it can be easily expanded. You don't have to look far to find a mobile home with additions that, over the years, have contributed more floor space to a home than that of the original trailer. Provided you've cleared it with your local building department and zoning board, one of the simplest ways to double the size of your home is to park two mobile homes side by side and join them together. While by no means a simple project, it's the fastest and most economical way to increase the living space in your home. Building a framework to connect your trailers isn't technically challenging but it does require skill and planning. Strip the siding from both mobile homes on the sides that will be joined. Build two framed sections from 2-by-4 lumber, one matched to the wall dimensions of the first mobile and the other matched to wall dimensions of the second mobile. 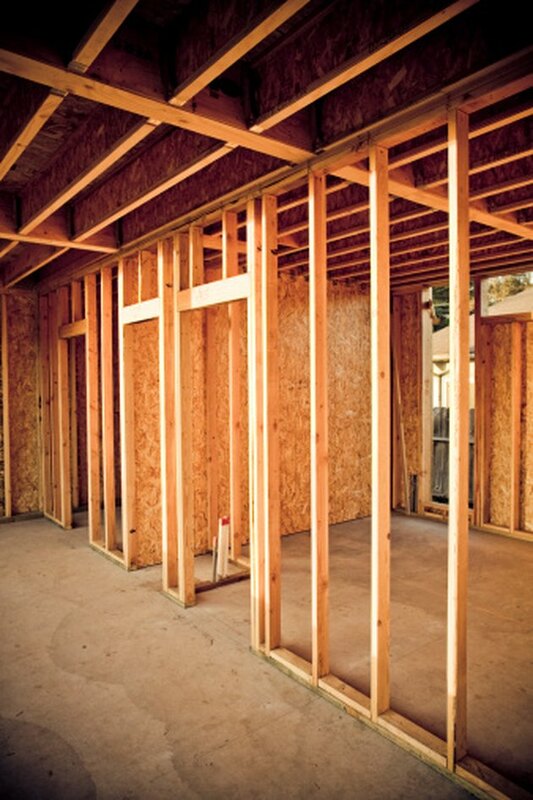 Lay the framed sections on the ground and slide a series of horizontal 2 by 6 beams between the 2-by-4 lumber, spaced 24 inches apart on the vertical axis. Align the 2-by-6 boards so that those on one frame match up as closely as possible to the other, using the bottom of the 2-by-4 frame as a reference. It's a lot easier to match the two framed walls on the ground than it will be later. Secure the 2-by-6 boards to the framing and lift the sections up against the existing trailer walls. Secure each section to the existing walls using heavy-duty steel bolt plates and bolts. Maneuver your second trailer so the 2-by-6 beams on the framed walls line up as you measured them on the ground. Be prepared to adjust the trailer angle and height so that the two trailers match exactly. Remove the inner siding, trim and insulation from the add-on trailer to access the framing between the homes. Be careful not to damage these materials, as you will be reinstalling them later. Drill 1/2-inch holes through the 2-by-6 lumber on both frameworks and install a 6-inch Grade 8 bolt using washers on both sides. Hold the nut on the back with a wrench and tighten the bolt with an impact wrench. Repeat this procedure along the length of the trailer on each of the 2-by-6 supports. The trailers are now structurally joined. Build doorways between the two trailers, using lengths of 2-by-6 or 2-by-8 lumber to fill the space between the trailers and frame the doorway. Go under the trailers and create a sub-floor out of 3/4-inch plywood to join the trailers and fill the gap between them. You have two options after you get the flooring in and have the interior panels reinstalled on the addition. You can either fill the space between the trailers with loose-fill insulation or leave it open. Join the tops of the trailers with a piece of 3/4-inch plywood cut to overhang the tops of the trailer peaks by about 3 inches on each side. Install a pre-formed roof cap over the plywood and secure it to the roof of the joined trailers on either side of the plywood overhang. This will provide a double-layer of protection against water leakage into the space between the trailers. How Do I Build Wall Cabinets for Double Ovens?